I caught 1A with Joshua Johnson the other day, and was happy to hear my friend Joshua Coleman featured. The discussion was about family estrangement, which is Joshua’s clinical specialty (he’s a psychologist), and the subject of his book, When Parents Hurt: Compassionate Strategies When You and Your Grown Child Don’t Get Along. Joshua works with a lot of parents who have been estranged by their adult children, which in the social media era doesn’t necessarily mean being cut off, like it might have once upon a time — now it might mean being subjected to constant reminders of children’s social and family lives that deliberately exclude parents. Of course, the freedom to estrange oneself from a family is very important, and a great thing about modern family life. But it’s also often awful. And it highlights the intense and rapid generational changes we’re going through as well. So this is something to wrestle with, which is what the show did. One of the things that’s confusing for so many of the estranged parents I work with is that what gets called abusive or traumatizing behavior today would not have been considered abusive or traumatizing in their generation. This relates to what [Nick] Haslam refers to as “concept creep”: the process of expanding the definition of what is considered harmful behavior. From my perspective as a psychologist this causes some adult children to justify their estrangements or negative evaluations of their parents’ actions. We also live in a society, and at a time where so much is being put onto parents’ shoulders, that other cultures have the wisdom to not put onto the parents’ shoulders. For example, in most Western industrialized nations there is free or highly subsidized childcare, free or highly subsidized college, free or highly subsidized insurance – while in America this is all up to the parent. So there’s a reason that today’s parents are deeply worried and over-involved and concerned about their children’s safety and well-being because it’s all on them. Not only are their adult children sometimes accusing them of not doing enough or doing it well, but so is everyone else including self-help authors and politicians. There is of course real abuse and trauma that occurs at the hands of parents; I’m not saying it never occurs, I’m just saying the concept has been so greatly expanded that it’s becoming more of a problem than an asset. The count confirms this. The show averaged 2.8 guests per episode. So how are the men and women distributed? Of the 46 shows aired in September, 12 featured just one guest, 8 of whom were male. Male guests outnumbered female guests overall in 29 episodes, or 63% of the shows. Female guests outnumbered men in only 8 shows (17%), with the remaining 9 (20%) being gender balanced. What accounts for my annoyance, maybe, was that in those male-dominated shows, more than half (16 of 29) featured just one woman and more than one man. The reverse – one man and more than one woman – happened just three times. Details in the figure. The most common configuration is one woman and two men. Is it me or is the liberal media elite getting more tone-deaf? For whatever reason, one of the first things I read today was this David Brooks column, “The Nature of Poverty.” Brooks is selling character these days, so his own brand of vapid exhortation on the subject has reached a fever pitch in his columns. But in this case what struck me was not the pedantic “we’ve done so much and they are still not pulling their own weight” thing (not a quote), but the extreme blindness on the issue of the protests — which he didn’t even mention (after this sociology 101 fail of an opening: “Lately it seems as though every few months there’s another urban riot” — which is a quote). Of course, social organization is a big issue, and concentrating the efforts of poor communities for successful social change is vitally important. Brooks sees the dysfunction, and the riot, but he doesn’t see the beautifully unfolding protest, the real story of the day. After that aggravation, imagine my delight when, as my New York Times / NPR morning unfolded, I found out Nina Totenberg was one of the panelists on the Diane Rehm show’s weekly news roundup. Always rational and erudite, a keen legal analyst, she may be the favorite voice on NPR. But today her cluelessness reminded me a lot of Brooks’. If you go to Baltimore – and they’re our neighbors here, and we go all the time – it is the quintessential example of a city that once was a thriving manufacturing, also a port, city. And now when you go there, they’ve built up the Harbor, and that’s lovely, but you drive through that city – it’s not that big – and half of it looks boarded up, people are standing on the street corners looking – just hanging out, looking like they’re probably drunk, and with nothing to do. It is sort of – the scene when you drive through the city, if you’re going to Johns Hopkins for something, and you drive through that city, it is reminiscent of what townships looked like in apartheid South Africa. It’s not a pretty sight. Of course, unemployment is a serious problem in the poor parts of Baltimore — and their addicts can’t as easily conceal their condition as can those with more wealth and real estate. But it’s the old, scared-White-person-driving-through-the-ghetto thing that Rand Paul illustrated the other day with, “I came through the train on Baltimore last night. I’m glad the train didn’t stop.” You would think Totenberg would have watched The Wire at least enough to get the point that behind the unemployed people on street corners — inside the homes that you can’t drive through — there are men, women, and children doing all the other things people try to do everywhere else in the country, but with less money and more police brutality to contend with. Well, I suppose it does. But I don’t see that people who are setting fires and breaking windows and looting stores, that you can call it a rebellion. That’s a really – that’s a stretch for me. You can have terrible wrongs, at the same time that you have a reaction that’s – inappropriate – let’s put it that way. I mean, I read a story that even some of the gang members [chuckle] were helping to calm things down. First, I’m trying to think of an example from history of something that you would call a rebellion — in anything but a metaphorical sense — that would not include setting fires, breaking windows, and looting stores. To make matters worse, her followup gang comment, rather than illustrating a heightened level of community solidarity that has appeared in Baltimore, is somehow supposed to make the rioters look even more savage, because they’re even offending gang members. Page: We’ve gotten several emails, directed at you Nina, and a comment that you made earlier. I’ll just read one of them from W. Middleton, who’s writing us from Ohio, this person writes, “I am troubled by the poor choice of words describing citizens of Baltimore. To say that people are just standing around and looking drunk is insulting and in many ways captures a racist portrayal of communities of color.” What would you say, Nina? Totenberg: Well, I s— didn’t have in mind any particular race. What I had in mind was people who obviously have no job, nothing to do, are standing on the corner, not fully functional, perhaps I should’ve said “not fully functional,” and that is the saddest thing in a, in a country that prides itself on the ability to – uh, as a working country. Completely missing the point that it’s not necessarily offensive to describe a drunk person on the street corner as a drunk person on a street corner, what’s offensive is describing half the city as a drunk person on a street corner. The authenticity craze sweeping young people is accentuated by social media, which delivers “real time” information, and smartphone cameras, which are perceived as unedited windows into reality. That these old media elites would say things offensive to poor Black people is of course not news. But what strikes me more and more is that the out-of-touchness of their offensiveness is growing increasingly apparent in contrast to the wave of apparently (if not actually) unmediated, authentic information all around them. The people who make up these things drive me bananas. The definition NPR gives for this generation is “people born between 1980 and 2000.” And it’s true there are more than 80 million of them. In fact, there are 91 million of them, according to the 2012 American Community Survey data you can get from IPUMS.org. * That’s OK, though, because there are only 76 million Baby Boomers, so the claim checks out. The Baby Boom was a demographic event. In 1946, after the end of World War II, the crude birth rate — the number of births per 1,000 population — jumped from 20.4 to 24.1, the biggest one-year change recorded in U.S. history. The birth rate didn’t fall back to its previous level until 1965. That’s why the Baby Boom went down in history as 1946 to 1964. Because that’s when it happened. Even with population growth I reckon the people born in the years 1946-1964 might outnumber the self-promoting millennials if not for the weight of mortality pulling down the purple bars. But if the young NPR reporters want to brag about outnumbering a generation that is starting to lose its older members to old age (and who are, after all, their parents), then I guess the shoe fits. 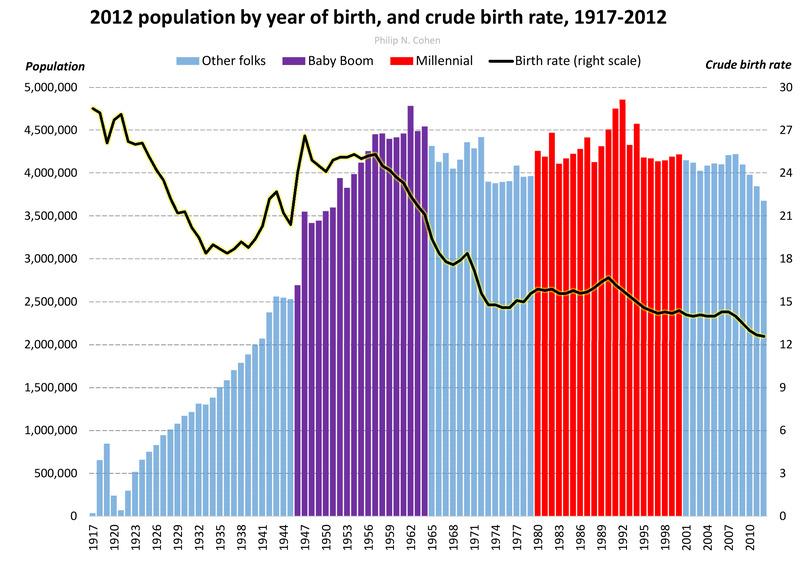 The Baby Boom was not a generation. It was a cohort, “a group of people sharing a common demographic experience” (in this case birth during the same period). That demographic event happens to have lasted 18 years, which is unfortunate because that may have contributed to the tendency to declare “generations” of similar lengths. Real generations rarely have starting and ending points on a population level. Populations usually just keeping having births every year in smooth patterns of increase or decrease without discrete edges, so generations overlap. Even in families it gets hard to nail down generations once you start moving horizontally; siblings born many years apart are in the same generation, but the cousins get all confused. Meaningful cohorts, on the other hand, can be defined all over the place, such as: the people who graduated college during the Great Recession, people who introduced the Internet to their parents, and so on. These are not generations. So if you were born in 1960, graduated college in 1982, and entered the labor force in the middle of an awful recession, then managed to pull some kind of career together, got married and divorced, by the 90s it was time to be downsized already for the first time, you’re 40 in 2000, and it’s time for the dot-com bubble, you’re out of your job again, and here you are ready for your retirement, finally, you’ve been left in your own 401(k), having to put together your own pension, and of course now that’s in the tank and your house isn’t worth anything. So that insecurity and instability is really imprinted this group. We talk about the 60s, and civil rights and antiwar, and great music and everything, but that’s seeming like a long time ago now for people who are looking at retirement. I don’t know if anyone actually had that experience, but it seems likely. Anyway, if people really want to keep using these generation labels, and it seems unlikely to stop now given the marketing payoff from naming rights, than that’s the way it goes. But please don’t ask demographers to define them. * This is a little different from the population estimates the Census Bureau produces, which are coded by age rather than year of birth. I use the ACS data because they report year of birth, and because it’s easier. The differences are very small. ** Thanks to Mo Willow for pointing this out.